Entscheiden Sie sich für einen vielseitigen PC, der alles bietet: Intelligenz, Leistungsstärke und Eleganz. Dieser leistungsstarke Entertainment-PC ist ein wahres Kraftpaket für digitale Unterhaltung. Er überzeugt durch neueste mobile Technologie, die Sie auch unterwegs in Verbindung hält – und dies alles in einem neuen eleganten Design. 80% It’s hard to beat this low-priced, lightweight dual-core laptop. With its 14.1-inch widescreen wrapped in a 6.3-pound, one-inch–thick shell, the HP Pavilion dv2000t is a more portable multimedia machine than the rather bulky 15.4-inch entries here. The slick design, with its subtly pinstriped black-lacquer exterior and glossy silver interior, still hasn’t worn out its welcome (though constantly wiping off the fingerprints has), and HP goes the extra mile when it comes to convenience touches. Extraordinary styling and a complete feature set make the HP Pavilion dv2000t stand out among affordable widescreen notebooks. We thought previous HP Pavilions were pretty stylish, but the new design of the dv2000t is even more appealing and makes the major competition look stale by comparison. Add to that a complete feature set and an attractive price ($1,149 after $100 mail-in rebate and $50 instant savings), and it's easy to understand the line's growing popularity. Slick is the best way to describe the 5.3-pound dv2000t's look. The high-gloss, piano-black exterior, with its subtle pinstriped wave pattern, is appealing to the eye and touch. At only one inch thick, this notebook is easy to carry. Open the latchless lid and you'll find a black keyboard offset by a glossy silver surround. 78% With its beautiful design, the Pavilion dv2000t notebook will most certainly attract attention. The HP dv2000t is a superb ultra-portable notebook. It's well-designed and competitively priced with a starting price of $750. 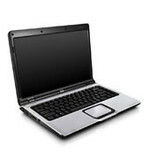 As a 14.1” notebook powered by the Core Duo, the dv2000t provides a robust platform for both business and home users. The dv2000 does a superb job with its excellent battery life, superb keyboard, HP tech support, and fashionable design that’s not too gaudy or out of place in a boardroom. How good was the HP dv2000t? I bought one for myself. To reiterate, the HP dv2000t is a lightweight but powerful machine that's perfect for college or home/office use. Although it lacks in gaming performance for post-2004 3D games, it is a great solution for people who only do office work, listen to music, watch movies, etc. The webcam option makes the notebook great for Skype or MSN video chatting with its decent 1.3 Megapixel camera and 2 omni-directional microphones integrated above the screen. Aside from the cheap mouse buttons and glossy touchpad, the notebook feels very solid throughout. The 14.1" BrightView widescreen 1280x800 LCD and full size alphanumerical keys makes it comfortable for long-term typing and viewing. With the release of the Pavilion dv2000, HP inaugurates a new look and feel for its Pavilion line of laptops. Departing from the familiar matte silver-and-black case, the dv2000 has sleek rounded edges, a high-gloss finish (which HP says is particularly scratch resistant), and a subtle Zen wave design on the lid. Looks aside, however, the Pavilion dv2000 sticks to the same basic script as previous Pavilion models: you get a strong set of components and most of the features that a home user will want for a competitive price, starting at $830. HP has also upped the ante with the dv2000's processor options: you can configure it with either an Intel Core Solo or Core Duo, or AMD Sempron or Turion 64 X2 processors.